After a bit of dilly-dallying finally made plans to visit Madurai and South Tamilnadu. I was always under the impression that Coimbatore was the starting point to reach anywhere in Tamilnadu from my parts in Kerala. I did a Google Maps search and found there was a quicker route to reach Madurai via Pollachi without touching Coimbatore. So, started early and got a bus to Alathur from my village Elanad, reached Alathur at around 7:45 am and took a bus to Nemmara a frontier town in the Palakkad district. Then I took a Tamilnadu Govt. operated bus to Pollachi, got off at Pollachi and had breakfast, and got a direct bus to Madurai at 10:00 am. It had rained for the past couple of days around Pollachi area and it was relatively cooler for this period of time. 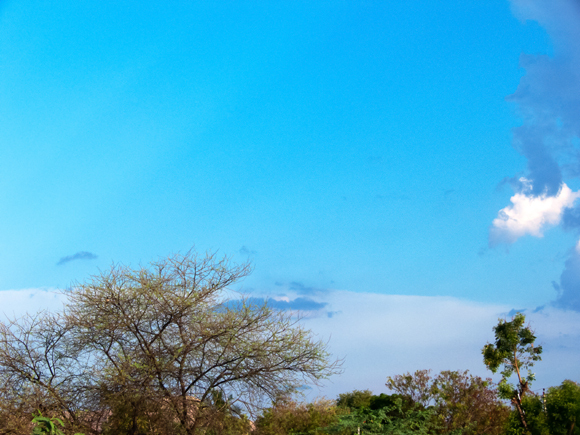 The surroundings had a fresh look and new growth of vegetation was seen throughout the drive down to Madurai. We reached Palani a temple town and the bus stopped for a tea break. 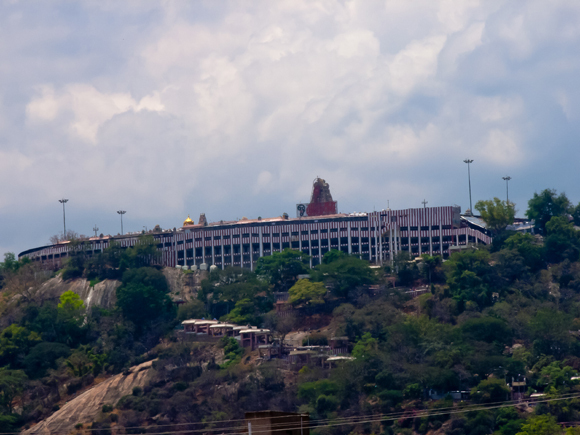 I went near the bus stand entrance and took a couple of pictures of famous Palani Murugan Temple. Murugan Temple, Palani from the Palani Bus Station. On route the bus stopped at a small restaurant in a place called Kanipatti and I had a sumptuous lunch (I always wondered how the sambar and other curries tasted great without the addition of grated coconut as we do at home in Kerala). The roads were great and there were few traffic snarls. Reached Madurai at around 2:30 pm and the bus dropped me off in a distant bus stop called Arapalayam. I tried calling Mr Chandrabose, with whom I had made prior arrangements for accommodation. 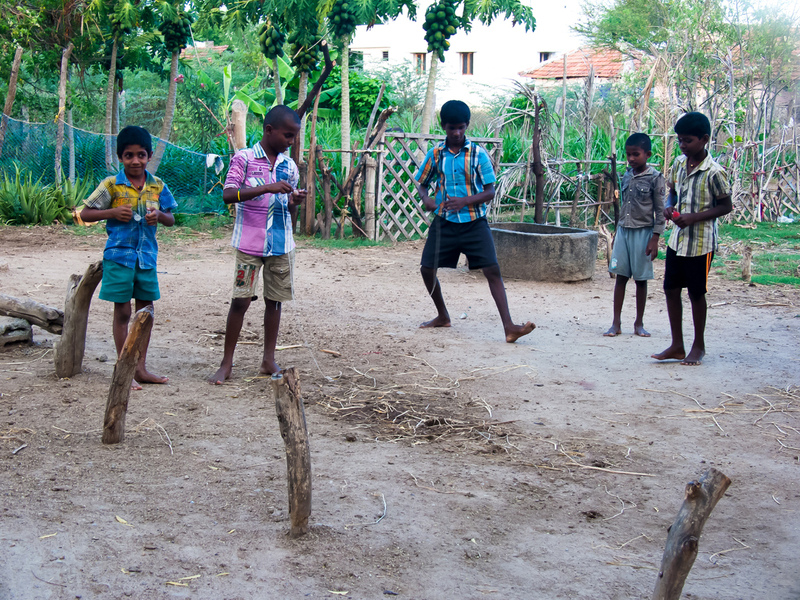 Mr.Chandrabose runs a small homestay and a children’s home called Dil Se. I could not get through to him and with the assistance of Karthik I reached another bus stand called Mattuthavani and hired an autorickshaw to take me to Dil se Homestay. The autorickshaw driver took Rs.200/- for getting me there (I spent only Rs.190/- for 265 km to Madurai), it was a total rip off. Then I came to know there was no power at my host’s place and the owner’s phone had run out of battery charge. Anyways, I was glad to reach the homestay. Mr Chandra Bose, a Gandhian, member of the Gandhi Museum Madurai, runs an orphanage for underprivileged children, Yoga teacher, member of the interfaith peace group, and a widely traveled gentleman. Mr Chandrabose is a Gandhian and a member of the Gandhi museum in Madurai and he runs an orphanage for young financially backward students. He currently has 12 children living him. Many have completed their term in school and some will be going home. Mr.Chandrabose soft-spoken person with varied interests in charity, Gandian studies, and peace activities. 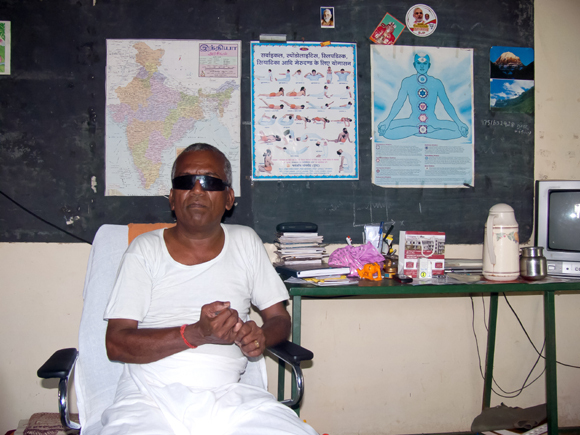 He has had a recent cataract operation and is limiting his travel and other activities. Mr Chandrabose asked for tea and told me an amazing story related to his recent trip in January to Srilanka. This trip to Srilanka was organised by a Japanese Buddhist Organization called Nipponzan Myohoji (Japan Buddha Sangh). It is founded by Nichidatsu Fujii. They are a group of Buddhist monks and nuns of the Nichiren Buddhist sect, who pray for world peace and have pagodas all over the world. A Buddhist Pagoda built by Mr Chandra Bose in his village, Alathur outskirts of Madurai. The story is about a Japanese Buddhist monk during the peak of the Tamil Separatist movement. 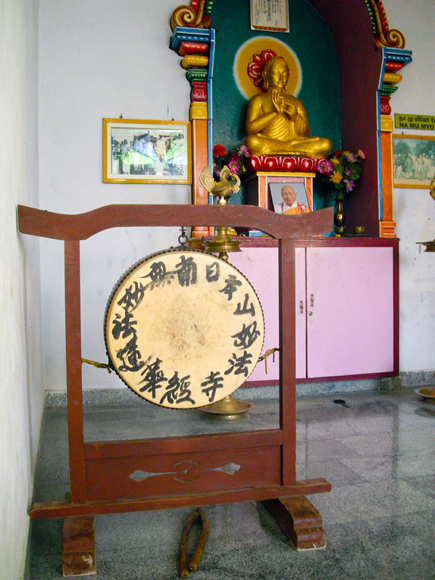 The monk lived in Jaffna and goes about the town beating a drum and chanting Buddhist slokas for peace and non-violence. The LTTE faction was not comfortable with this monk (as the Sinhalese are Buddhists but of the Hinayana sect and the monk of the Mahayana sect) and they kept threatening him. The LTTE forced the locals not to provide food and made life miserable for this monk. The locals smuggled food to this monk on occasions. The top people in Nipponzan Myohoji came to know the plight of this monk in Jaffna and they sent another monk to bring him back. Finally, the harassed monk left Jaffna for good to Chennai, India, but the other messenger monk stayed back for a couple of days more to see the ravages of war and pray for peace. On the fourth day, a different set of LTTE fighters saw this monk and mistook him for the earlier one and threatened him with death. The messenger monk did not resist and said if killing him will bring peace, he was ready to die. I was told the LTTE shot him dead in the same street square. 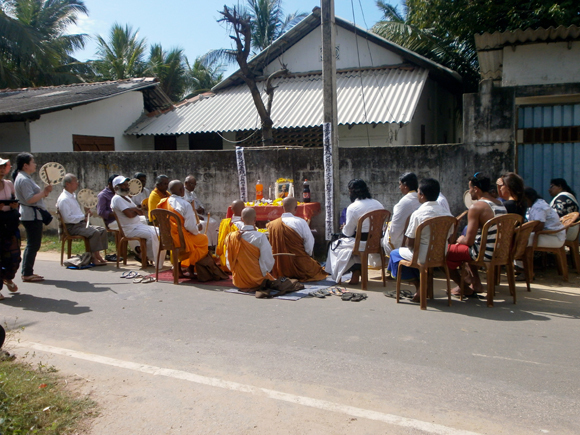 Now after the end of the brutal Srilankan war, the Nipponzan Myohoji foundation sends people to Jaffna and conduct prayer meetings in the same spot on the death anniversary of the messenger monk, and pray for his salvation and world peace. I was totally touched by this story and was glad that Mr Chandrabose related this to me. 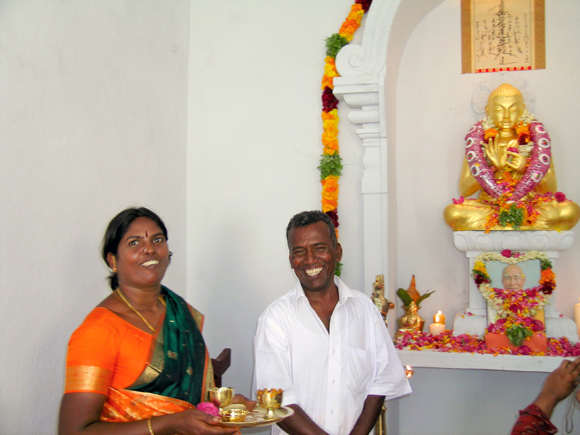 Mr Chandrabose has built a small Buddhist temple in his village and Buddhist monks visit the temple and his place often. I had an opportunity to meet a lady Buddhist monk on the last day of my stay at Dil se Homestay. My room was ready and a little boy came with me to show me the room. The rooms are located a bit away from the Children’s Home. It was clean and airy on the first floor. After freshening up, I went down to the main house and spent some time with the children of the home, who were spinning tops. I took some pictures of the boys and the surroundings. I got back to the room and had a bath. At around 7:45 pm, a boy came and told me that dinner was ready. I had my dinner with the children of the home. The dinner was simple and tasty consisting of chappathis and cauliflower curry. Mr Chandrabose spoke to me about his life, the starting of the Home for children and how his wife and children were very supportive of this idea (his wife and children take active interest in running this home) He told me that apart from sending the children to school, he teaches them basic survival skills. It was quite a day and I went to bed content and happy that there are some truly nice people in this world. What a lovely post! I hope one day to make a trip like this and to see the Children’s Home and the museum. It sounds like a wonderful experience. Thank you, Suzy! Let me know when and we will assist you!